This chapter gives an overview of the theoretical underpinnings behind XpertMart™'s design and provides a quick overview of all the features in the system. There are two modes in which XpertMart™ runs: as a Main station or as a Remote station. Broadly speaking, the Main is where you create and administer Catalogs whereas the Remote is where you make transactions by creating Documents. In a chain of stores, there is typically only one Main and as many Remotes as there are stores or warehouses. The Main is typically installed at the home office, corporate headquarters or some central distribution warehouse and is used by the MIS or Systems department, Purchasing, Operations, Comptroller, Accounting and General Management or anyone else who need to synthesize and analyze the information in the system to make decisions. The Remote is installed in stores or warehouses and is generally used by people at the point of sale or who have direct contact with the merchandise such as: Cashiers, Store Supervisors, Store Managers and warehouse personnel. XpertMart™ automatically detects whether it is running a Main or a Remote based on a code embedded in the HASP key. In case you happen to be running both the Main and a Remote on the same computer, XpertMart™ will ask you if you want to run the Main every time you launch the program. If you click <Yes> you will enter the Main; if you click <No> you will work as a Remote. Note that when you have both the Main and a Remote on the same computer, they share the exact same database and any configuration changes made in one will be reflected in the other. The Main and the Remote are virtually identical except that some options are restricted in each. These difference are reflected in the order of the Main Menu. The Main Menu at the Main has Catalogs as the second menu appearing after the File Menu, since the principal function of the Main is to maintain the Catalogs. The Transactions menu is more limited at the Main, since XpertMart™ only allows two transactions to be made at the Main: Purchase Orders and Cost Adjustments. The Main Menu at the Remote looks very similar, only instead of Catalogs, the second menu appearing after the File Menu is Transactions since the principal function of the Remote is to execute transactions. The Configure Menu is more limited at the Remote, since only the Main can configure security or add a store. Other than these minor differences, the Main Menu is the same at both the Main and the Remote. All windows look the same whether they are launched from the Main or the Remote, the only difference is that when a Remote accesses a Catalog, some of the fields will appear in gray as they cannot be edited. Such is the case with Price and Cost, which are set at the Main. While a user at a Remote can look-up the Price or Cost of an item, only a user at the Main (with the right security level) can change the Price or Cost. A user who knows his or her way around the Main will be equally comfortable working at a Remote and vice-versa. A Catalog is where information is stored that is accessed by other parts of the system. For example, when you make an invoice and ring up an item, it is accessing information about that item's color, size, price and cost from the Items Catalog. There is only one set of Catalogs that is used by every store and warehouse in the chain. So when a user at the Main changes information in a catalog (for example, modifies the price of an item in the Items Catalog) all Remote stations will work off of the modified catalog (once a synchronizaiton cycle is completed). 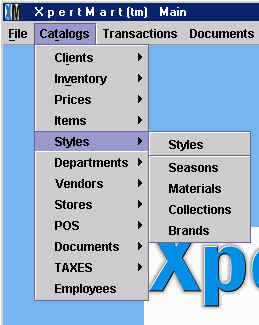 While there are descriptive Catalogs that store information about your Styles, Employees and Customers, there are also Catalogs that store functional information such as the payment types you accept at the point of sale, the types of transportation available to use in inter-store transfers and the terms offered by your vendors. There are over 50 different catalogues in XpertMart™. To learn more about Catalogs, consult the Catalogs Topic. The only Catalog that can be modified at a Remote is the Customer Catalog since information about customers is generally captured at the point of sale. All other Catalogs (including Catalogs such as Customer Type and Customer Region) can only be modified at the Main. 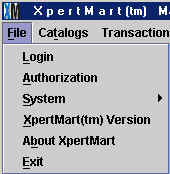 When you make a transaction in XpertMart™ you are in fact making a document. The information generated by that transaction (such as number of items, price, cost, date, time, and so on) is stored in a document. There are presently 12 documents that can be made at a Remote: Invoice (sale), Lost Sale, Sale Order (layaway), Return, Receipt, Return Receipt, Purchase Order, In Slip, Out Slip, In Slip Correction, Out Slip Correction, Adjustment, Cost Adjustment and Count. The date, time and employee using the system are automatically recorded onto every document. Purchase Orders, Counts and Sale Orders (unless configured otherwise) do not affect inventory as they are only referenced by other documents. Reading from left to right, we can trace the flow of inventory from the time merchandise is received from a vendor using to the time it is sold to a customer. Purchase Orders do not affect inventory directly but they can be refereced by Receipts. Since Purchase Orders are not mandatory, the link to Receipts is shown as a dotted line. Receipts are used to capture information about the merchandise that was received and they directly affect inventory by adding stock. Return Receipts are used when defective or incorrect merchandise is returned to a vendor and affects inventory by subracting stock. Out Slips are used to transfer merchandise out of a store and In Slips are used to receive the transfered merchandise. 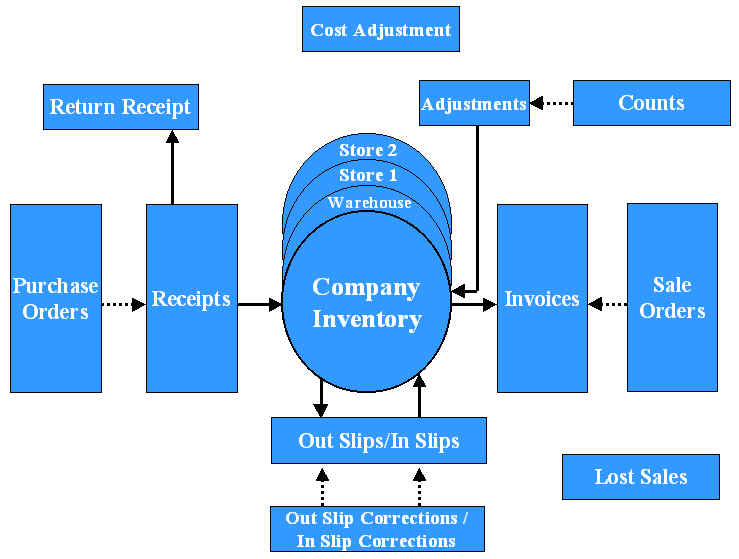 Out/In Slips do not affect the company's total inventory, but they do affect the inventory of an individual store. Out/In Slip Corrections are used to correct any errors that are detected in the transfer process. Invoices are generated every time a sale is made and affect inventory by subtracting stock. Invoices can reference an exisitng Sale Order, or layaway, but are by no means required to. Unless you specifically configure XpertMart™ to do so, Sale Orders do not affect inventory. Counts are used to store the information on stock levels gathered during a physical inventory but do not affect inventory directly. To modify the stock level in the system, an Adjustment must be used. Cost Adjustments are used to modify the cost of merchandise but do not affect inventory levels. Finally, Lost Sales are used to capture information about items customers are looking for but are not in stock and do not affect inventory as they are merely informative. The only documents that can be generate at the Main are Purchase Orders and Cost Adjustments. While any store can at any time view the stock level of the other stores in the chain, a Remote station can only view its own documents. You cannot see another Remote's documents from a Remote; only the Main has that kind of access. The division of labor between the Main and Remote is intentional. Just as in a casino where there is one dealer to deal the cards and another dealer to count the money, it is important that the Main not make any transactions and just "count the money." While other systems typically allow the Main to carry out such transactions as invoicing, receiving or transfers, at XpertMart™ we believe this constitutes a loss of control. Every store at every moment needs to be 100% responsible for its inventory. In other words, at any moment a manager at the home office (Main) should be able to ask the store manager (Remote) what the current inventory is and be able to justify it through an audit trail. However, if a user at the Main can make a transaction for any store, then managers at the store will never have a precise idea of how much inventory they have (since they would have to wait until data from the Main was synchronized and even then there would always be the uncertainty that a new transaction could be taking place at the Main that would affect the inventory of their store). In this situation, responsibility is dispersed and ultimately lost since the store manager can always say, "that transaction wasn't ours, it was done at the Main" and vice-versa. Inventory Control at the Remote is assured through three interdependent elements: the stock on hand, the transaction documents and the Audit Log. Together we call these the Triangle of Control. Inventory Control is assured when all three of these pieces are in agreement. The stock on hand should match the total shown in the Audit Log and every entry in the Audit Log needs to be backed by its appropriate transaction document (e.g. Receipt, Transfer, Invoice, etc.). No change can be made to the stock level of any item without a document. All documents register the date and time they were made, and the employee making the document. Once made, documents cannot be edited or canceled. This way there is a permanent record of all changes to inventory that cannot be erased. If there is a mistake in a document, it is corrected through a counter-document. Documents can only be made in the store whose inventory level is being changed. In other words, a user in the Main (or at a different store) cannot make a document altering the stock level of a store. This prevents the possibility of discrepancies in the inventory level reported in a store and at the Main and focuses responsibility for inventory in only place: the store (or warehouse). Any time a document is made an entry in the Audit Log is automatically created for each item affected which shows: starting inventory (before document is applied), stock being added or subtracted from inventory, end inventory level, date, time, document type and document serial number. All data in the Audit Log can be accessed at any time in the stores both on-screen and in reports. XpertMart™ includes a battery of reports that show every change to an item’s stock level for a given day or date range, as well as summarized by style, department or store. If there is any doubt about a transaction, the document in question can always be accessed for review. There is no “merchandise in transit” when making a transfer. When merchandise leaves a store, it is recorded in an Out Slip and subtracted from the inventory. Only when the receiving store makes an In Slip, is the merchandise added to inventory. This way, the stock on hand in a store should always match exactly the stock level in the system at any and all moments. When the Main transmits data to the chain of stores, each store records the stock levels of the other stores in the chain but under no circumstances does it overwrite its own stock data. This way the integrity of the inventory information at each store is preserved. The stock levels in the system can always be audited through a physical inventory. XpertMart™’s physical inventory module automatically alerts you of any differences between the stock level reported in the system and the stock level in the actual count. Any discrepancies can be investigated by opening the Audit Log and examining the relevant documents that are cited. Each of these topics will be covered further in depth in subsequent chapters of the XpertMart™ User's Manual. There are eight menus in the Main Menu. The File Menu (shown below) contains several options that open windows with important information about XpertMart™. The File Menu is also where you will go every time you want to do a new Login, for example, if a different user needs to access the system. You will use the Catalogs Menu both to add new entries to your catalogs and to look-up information in these. Those submenus with an arrow after them indicate that there are further options within that submenu. These options appear when you highlight the submenu. Clicking on any one of these will open up the appropriate window, in this case, the catalog itself. In the example below, the Styles submenu contains the Styles, Seasons, Materials, Collections and Brands Catalogs. On the other hand, clicking on Employees will open the Employees Catalog directly as there is no arrow after the Employees submenu. The Transactions Menu (shown below) is where you will go when you need to create a new transaction. When you select one of the options in the Transactions menu a new window will open up where you can execute the transaction you have selected. Most of the time the Remote will have a Sales Transaction window open to quickly process a new sale; when the cashier needs to do a different transaciton, typically he or she will return to the Transactions Menu in the Main Menu to open a new window for the desired transaction. Once a transaction is complete it becomes a Document and it is stored in the appropriate Document Catalog: sales are stored in the Invoices Catalog, Lost Sales in the Lost Sales Catalog, and so on. Each one of these document catalog is a historic archive of every transaction that has taken place. If you want to make a new sale, you would go to the Transactions Menu, but if you wanted to see the sale you had just concluded, then you would go to the Documents Menu (shown below) to find it. The Document Catalogs are for reference only, the data in the fields cannot be modified or deleted. You will find the same toolbar as you find in all the other Catalogs and you will be able to perform the same kind of searches, for example, so see all Receipts between May 1st and May 3rd. 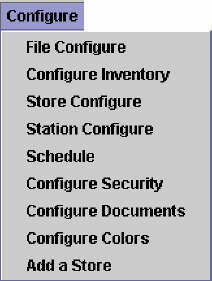 The Configure Menu (shown below) contains nine submenus where you can specify congifuration settings for how XpertMart™ stores and dsiplays information. Many of these setting should be specified before you begin using XpertMart™ and will be discussed in the next chapter. The Processes Menu (shown below) contains many of the processes managers use to optimize the functioning of the retail enterprise including: X-Out and Z-Out reports to monitor the flow of money at the stores; Transfers to balance inventory between stores; Physical Inventory to monitor discrepancies between actual stock on hand and that reported in the system; and Minimums and Maximums to set the optimum stock level for every item of merchandise. The Processes Menu also contains a few system processes that are run to ensure XpertMart™ runs smoothly. You will use the Synchronize Menu (shown below) to manage the synchronization process. Since each store is the owner of its own data (as discussed in the Philosophy of Control section) XpertMart™ can be said to use a distributed database since at any point in time the full database is distributed among the many Remotes and the Main. The database in each of these stations (Remotes and Main) must therefore be periodically "synchronized" so that they contain the same data. The Synchronize Menu contains all of the tools for each Remote to send its data to the Main, for the Main to consolidate all of this data and then send it back to the Remots. The Synchronize Menu also contains the Sync Logs which are reports that are automatically written every time there is a synchronization indicating the results of the transmission. 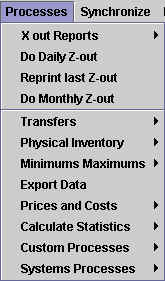 Finally, the Reports Menu is used to access many of the XpertMart™'s reports. These reports are grouped in broad categories by Catalog (for example, Brands reports) and by Document (e.g. Invoices reports) and can be launched from this Menu. Reports are also grouped by Employee (such as Cashier or Store Manager) depending on the kind of employee most likely to use the report. Note that the same report can be grouped in several locations. For example, the Top Brands report appears in both Catalog Reports>Brands and Employees>Store Manager. The Reports Menu is also where you will go when you need to launch the Report Designer to modify an existing report or create a new one. OK, now that you have a general overview of the system, it's time to get started.